Sound (7.4/10) – In stark contrast to the UE350 and UE600 models, the signature of the UE500 is very mildly v-shaped, with punchy bass and crisp, sparkly treble attracting the most attention. The low end of the UE500 is weaker than that of the UE350 but unlike the cheaper model, which is bassy all the time, the 500 can be impactful when it needs to be and balanced when it doesn’t. 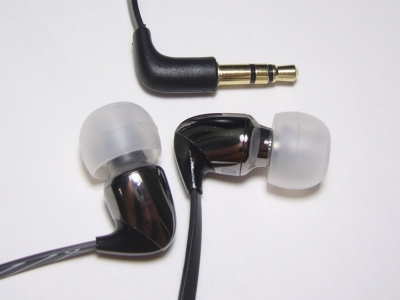 The bass is reasonably well-extended and has good impact for an earphone that can still be called balanced on the whole. It is not the tightest or quickest and there is slight mid-bass emphasis, giving the sound a very small amount of warmth and slight fullness compared to sets such as the RE-ZERO, but no discernible bloat or bleed. Those seeking Klipsch S4 or Beats by Dre-like bass power will want to look elsewhere. The midrange is slightly laid back and possesses good detail and clarity. Compared to the UE350, the UE500 sounds significantly cleaner, though it trades off some of the fullness and forwardness of the cheaper model. The top end is crisp and sparkly and the earphones would sound slightly bright overall if not for the mid-bass emphasis. Top-end extension is good but those who prefer laid-back treble might find the UE500 just a bit too energetic. The overall balance reminds me of the Sunrise Xcited – both earphones are spacious and reasonably balanced, with the Xcited being slightly clearer and more detailed but also brighter, edgier, and more aggressive. The UE500, on the other hand, offers more impact and a smoother sound. The presentation of the UE500 is spacious and airy. The sonic space is wider than it is deep or tall – not as well-rounded as something like the Sunrise Xcape IE or MEElec CC51. As a result, the UE500 has a bit of a tough time portraying intimacy compared even to the Sunrise Xcited, which has a similarly wide presentation, but is still very enjoyable overall. Instrument separation and overall resolution trail the Xcited slightly but the dynamics of the UEs are good and the layering is a touch more convincing than with the older BA-based SuperFi 4. One thing that surprised me knowing that the UE500 is a consumer-oriented earphone is the relatively low sensitivity – there will undoubtedly be complaints of low volume in the general populace, though the UE500 is still plenty loud next to the Phonak 012. Value (8.5/10) – The Ultimate Ears 500 differs both from UE’s lower-end dynamic-driver models and the old armature-based SuperFi line in offering a mildly v-shaped signature with impactful bass and sparkly treble. Thanks to its clean and detailed sound, it competes well with Head-Fi’s favorite mid-range IEMs, which is in itself is impressive for an earphone so readily available to the general public. The flat cable is rather poorly relieved for my liking and the frustrating plastic carrying case puts style above convenience but neither of these will stop me from recommending the UE500. Hey Joker, love the site. I just got these UE 500 recently and while I love how they sound, I’m already worried about the cable. I also own the UE 350 and they seem to have a much better cable, but one side’s volume dropped off at some point. What would you suggest as something with a very similar sound profile with improved build quality, maybe even angled nozzles? Thanks. I usually recommend something like a Soundmagic E10 or LG Quadbeat F420 as a UE500 alternative in the same price range. They both hold up a little better with use, especially the Soundmagics. If you’re looking for more of a step up in both sound and build, something like an Alpha & Delta AD01 or RHA MA750 would be a good choice. Angles nozzles are a bit tougher but there’s the Sennheiser Momentum, which sounds a little more v-shaped than the UE500 and isn’t as well-made as the MA750 or AD01, but is extremely comfortable. Thanks for the super fast reply! I lagged a bit on my own. I ended up going a different route and getting the Sony XBA-H1. Very impressed with the sound and the build quality seems pretty solid. Comfort is pretty decent, kinda reminds me of how the Klipsch S4 fit for me. Figured it was better to spend $100 on a single pair instead of buying $20 pairs every few weeks or whatever. First time spending more than a Benjamin on headphones. Definitely makes some of the stuff I usually listen to sound worse than I’m used to, but the trade off is worth it with higher quality recordings. Sounds like a good buy – glad you’re enjoying them! Build quality should honestly be lower imho. Had 3 pairs of these fail on me from cable wear at the jack; there is no strain relief on these whatsoever. Sound quality is great but value is poor despite the low price since you’re going to be replacing these within a few months. You’d be better off buying something like the Xiaomi Piston 2.0s which run even cheaper but are better overall. Also no replacements or warranty because these are discontinued. Trying to decide between the UE500 and UE600. My wife has the UE500, which I like. And with the closeouts on the Logitech UE line, I was thinking of getting something new. I currently have an older Shure e3c for myself that I enjoy, but the UE500 has given me the upgrade itch. I know the 600 should be slightly better, but is there really that much difference between the two? Any idea how the 600 might compare to the Shure E3C? The UE500 and UE600 don’t really sound alike. There’s a huge difference between the two just from a tuning standpoint. The UE500 is bass-heavy and somewhat v-shaped, with sparkly treble. The UE600 is flat and accurate, with very smooth treble, prominent mids, and level/non-enhanced bass. Not sure about the E3C but the E4C I had way back when was definitely more of a UE600 signature than UE500. –The 700’s I’ve even seen for as low as $70! My E3c’s (single armature) I think have detailed mids and highs, but lacks bass (I’m not a bass head, so no trouble there). From reviews of the E4C’s they have even better mid/high detail than the E3C’s, plus enhanced bass over the E3C’s. If, in your opinion, the UE600 and E4C’s sound very similar, perhaps that is the direction for me. (700 are supposed to be even more detailed, but bass sounds similar to my E3C’s: accurate but very flat and not much emphasis). Note: I found this description of the difference between the E3C/E4C from the Shure website forum. Basically from your description and what I’ve read, it seems like the E3C might sound like a UE600 if the UE600 had a little less detail and bass. It’s a reason I’m considering the UE700 now (more detail than the UE600. But I less bass, which is not as important to me). At those prices, you can’t go wrong with the 500 or 600. Get both! I go back and forth over which I prefer. ljokerl is 100% accurate in his description. And while I know the 600 is more accurate, I do prefer the sound of the 500 with no EQ and for me it’s more forgiving over a wide range of sources. If you get them, get some Sugru and mold it around the cord/jack junction – that’s a known design flaw of these.